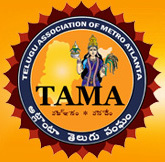 Come join us for TAMA Sankranthi Sambaralu on Satuday, January 13th, 2018 @ Mountain View High School in Lawrenceville, GA. Highlights include Art Competition for kids, Muggula Poti, Mehandi, Cultural programs by local talent, Raffle Prizes and Performances by Singers Nutana & Srikanth. We also get to meet Manasuku Nachchindi movie team Manjula & Sundeep. Get ready to taste the delicious food by our Silver Sponsor Cafe Bahar Restaurant.